Reminding you about TONIGHT's "Educational and Support Event" in the Five Towns! Please help us help you with letting your family and friends know about this Event. You never know that someone else within your circle might benefit from it… Pass the invitation or send us their email address to be added to our mailing list. Ps. There will NOT be a Live Online Video hookup, nor Teleconference! Will let you know if there will be any recordings. Five Towns, here we come! 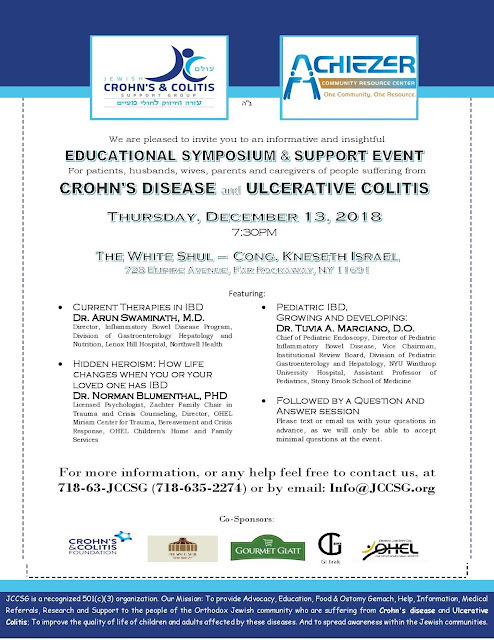 The Overwhelming demand and the positive feedback have inspired us to forge ahead with subsequent events, we are pleased to invite you to an informative and insightful Educational Symposium & Support Event for Patients, Husbands, wives, parents, and caregivers of people suffering from Crohn's Disease and Ulcerative Colitis. The event will take place Thursday, December 13, 2018, 7:30pm promptly, At The White Shul, 728 Empire Avenue, Far Rockaway, NY 11691. Parking available in adjacent parking lot. Dr. Tuvia A. Marciano, D.O. Followed by a Q&A Session. Feel free to submit your questions by emailing us in advance, as we will only be able to accept minimal questions at the event.